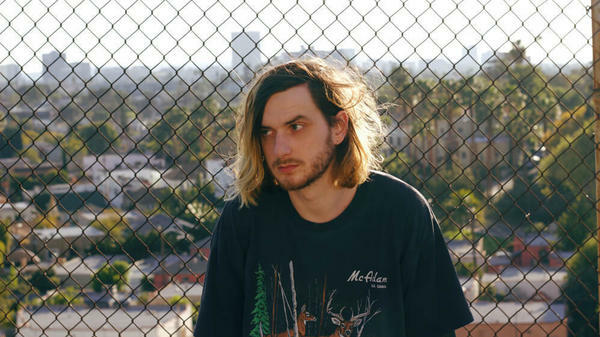 Clarence Clarity's self-released Leave Earth comes out later this year. Clarence Clarity's chrome-plated demento-pop truly has a mind of its own. "Fold 'Em" is the most recent in a string of singles anticipating his upcoming second album, Leave Earth. Compared with his sprawling, defective gem of a debut, 2015's No Now, he claims this one will be "more concise" — which isn't saying much, given the relentless bit-assault that is his music. As for its theme: Well, it's a "pop record from the future, set in Los Angeles as it gets sucked into the ocean," he tells NPR. The London producer likes to piece together bits of cultural detritus and put a frame around them. Listening to "Fold 'Em," it's clear the artist has a fixation with *NSYNC and the golden age of the Easy-Bake boy band, which he dresses in a mishmash of contemporary electronic garb. The song shares the uncomfortable crispness of the hyperreal pop collective PC Music as well as the sort of creepy-crawly production style championed by Arca. It's at once catchy and terrifying. According to Clarence Clarity, the song, which features a guest verse from Tampa-based rapper SHADI, "is about throwing out your interest in any noble quests because they're all beginning to seem futile. The irony being, unlike poker, when you give up on everything in the real world, you still have to chase the money. That, and how money slavery has poisoned the human psyche, but also how it saves us from ourselves. I dunno." Leave Earth comes out later this year.